While the cats away the mice will play, and as it were, while I was busy remodeling our horrific bathroom into a magical cottage bathroom, the chickens were busy scratching up my newly planted zinnias. I supposed then the cottage bathroom remodel process certainly didn’t come without costs, as zinnias are some of my most coveted and desired flower each summer. But the gain of the new bathroom was certainly worth even that high cost. 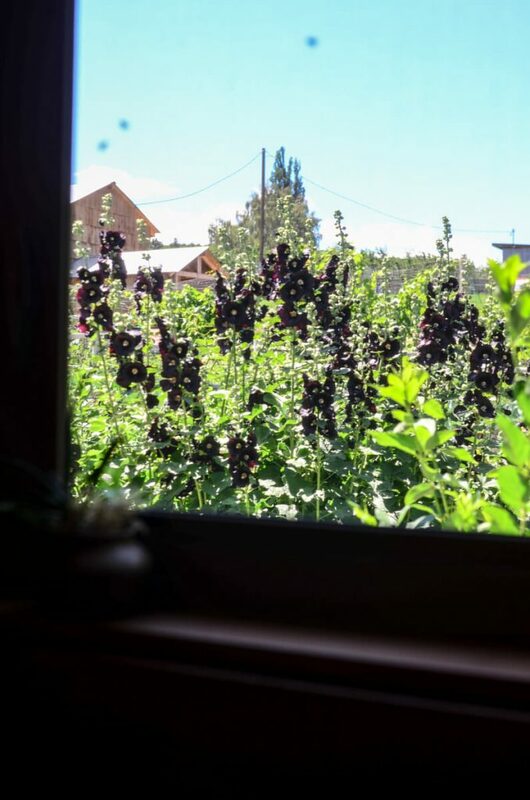 We’ve been in our hundred-year-old farmhouse for two years and a few months now, each day sweeter than the one before, as the perennials fill in, the grasses grow, and the home continues to mold to our needs and desires. Transforming these spaces has proven one of my greatest joys, and equally, one of my greatest challenges. 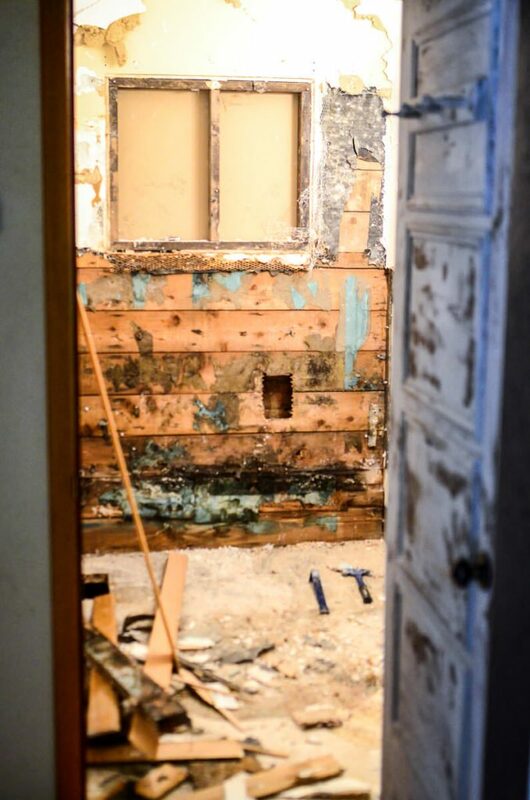 Knowing we needed to remodel the bathroom certainly wasn’t the problem though: there was no question about that. 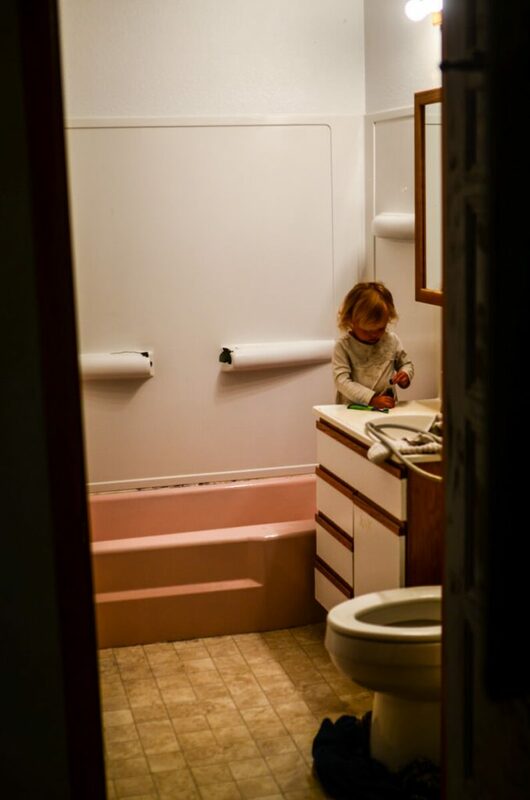 My guess is the last time it was tended to was sometime in the 80s – gauging by the pink bathtub, linoleum, and vanity lights respectfully. 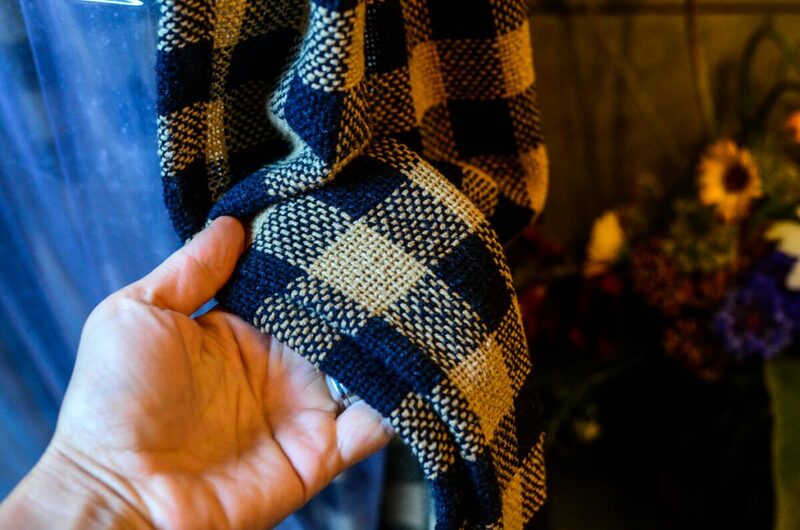 We moved to our farmhouse in the middle of winter when all the animals and children needed warm, safe shelter long before bathroom remodels could enter our mind. So we sat – some of us more patiently than others – staring at the bathroom and longing for the day we could take a sledgehammer to the walls. 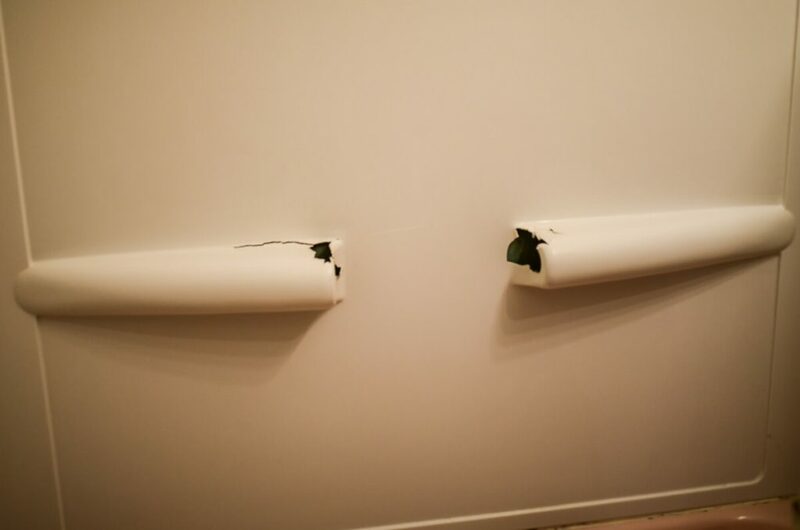 One night, in particular, I dreamt of the bathroom’s demise. 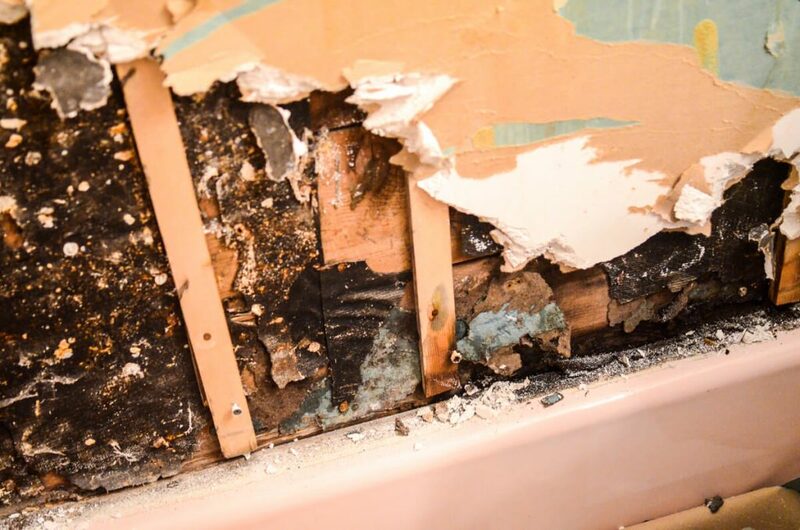 I lay in the bathtub (as I do every night) and listened to mice run around in the walls surrounding the tub… and listened to the toilet leaking out onto the rotten floor… ’twas time. So sledgehammer we did. Cottage bathroom here we come! 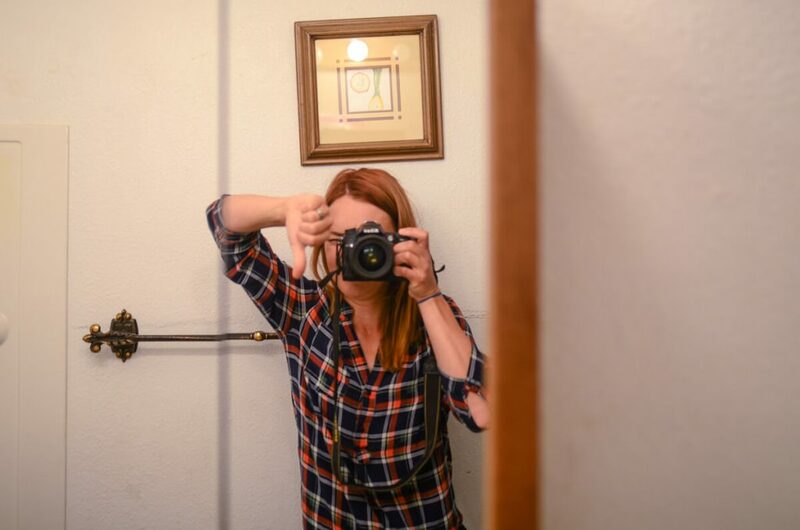 A big thumbs down to the old bathroom. Not that I wasn’t thankful to have a space to use. But really. I did hate it. This broke approximately .1823 seconds after we moved in. Go figure. First, it’s important to point out something: This bathroom is our only bathroom. We’re a family of six – yes, six – and we have one bathroom. Frankly, we’re used to it, and it’s totally fine (that is, until it came time to rip out our only toilet and shower). So while renovations were underway, we rented a Honey Bucket and took showers at my parent’s house. Second, let’s point this out as well: Does anyone else call portable toilets Honey Buckets? Stuart was confused by this terminology. Just thought I’d ask. Two, or three, or four, days of demo later, we were left with a gutted bathroom and slightly gutted spirits. We’d exposed decades of styles, trends, and rodent corpses (sorry, but true). 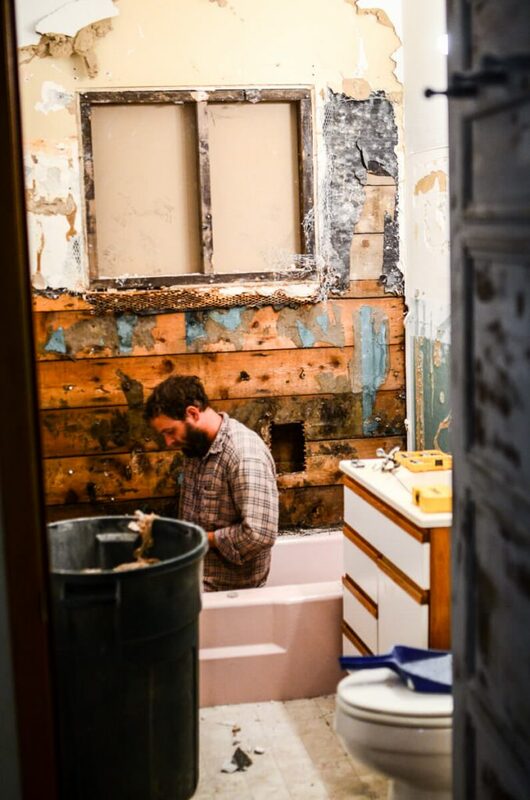 The dust from the demo covered every inch of the dining room and kitchen and as we struggled to remove the five-foot pink cast iron bathtub from the five-foot bathroom, there were a few moments of pure frustration. 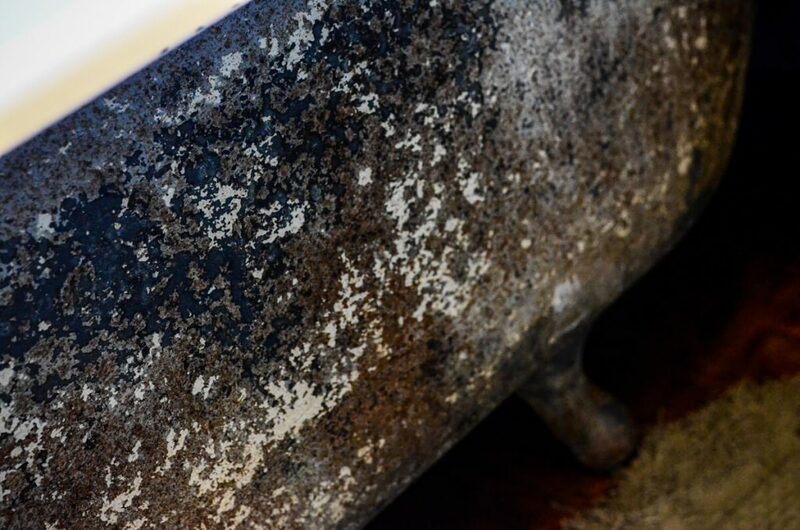 Don’t lash out at a cast iron bathtub. It wins. As these things always go, the project resolved, and I began to piece together the design puzzle. Often the most puzzling part of the puzzle is finding the right pieces. 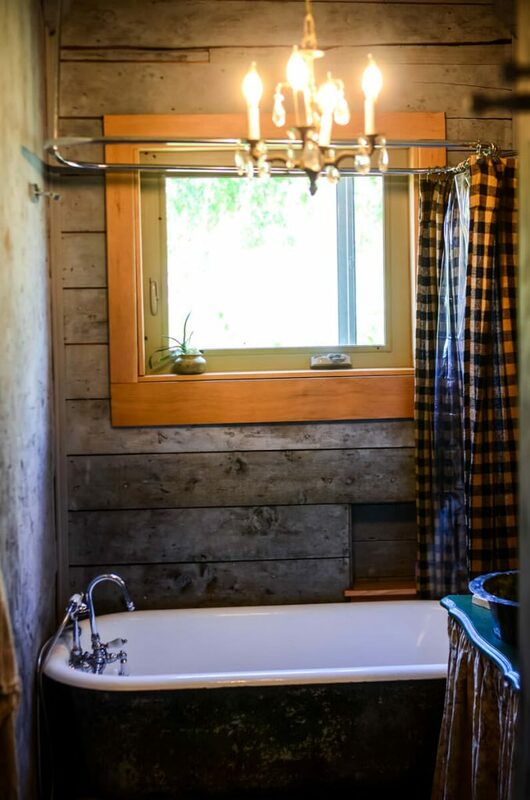 Wanting to stay true to the cottage bathroom vibe, it was important for me that the bathroom felt like it fit accordingly. This was the precise reason I shipped a vintage clawfoot tub up from Louisiana as soon as I found one I loved (and also the reason this particularly large puzzle piece had been sitting in our dining room for over three months). My friend Angela and I have a rule: if you can, go old. So looking at the puzzle, and looking at the cottage bathroom style I wanted to mimic, I recognized a few pieces I could actually go old on and I went for it. 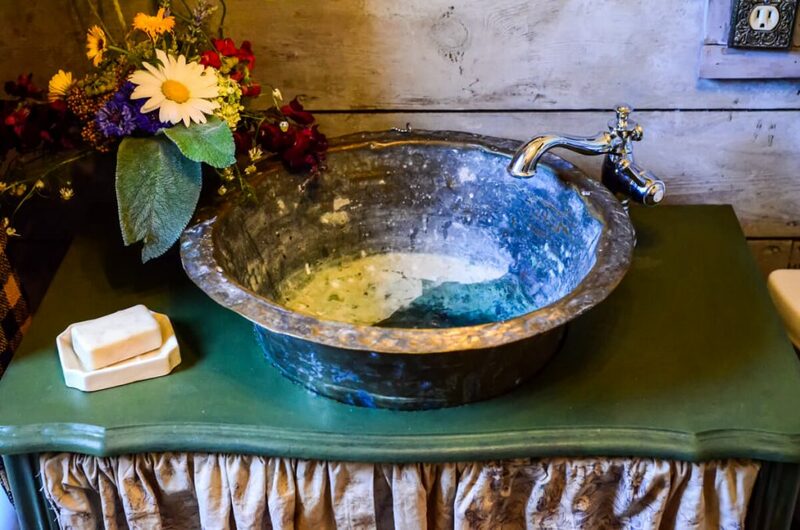 The sink was an old French-made brass basin from the 1800s. The chandelier, also French, and also old. 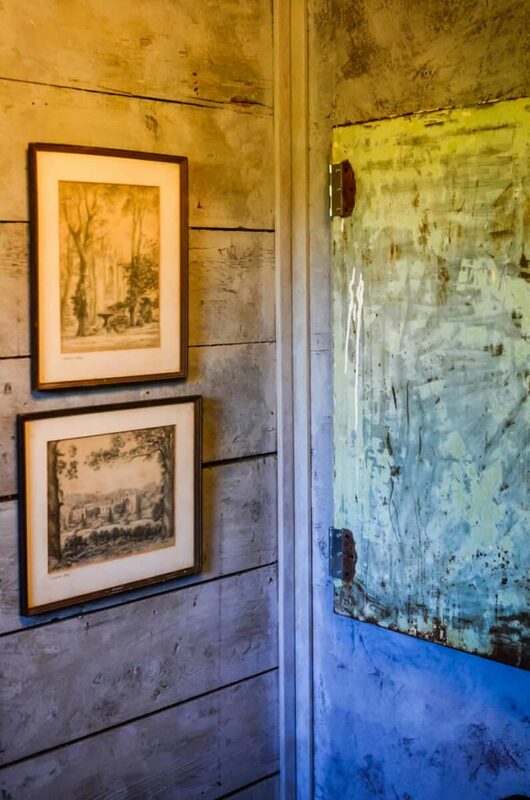 The shiplap is original to the farmhouse, with all it’s weird gaps, cracks, and imperfections. 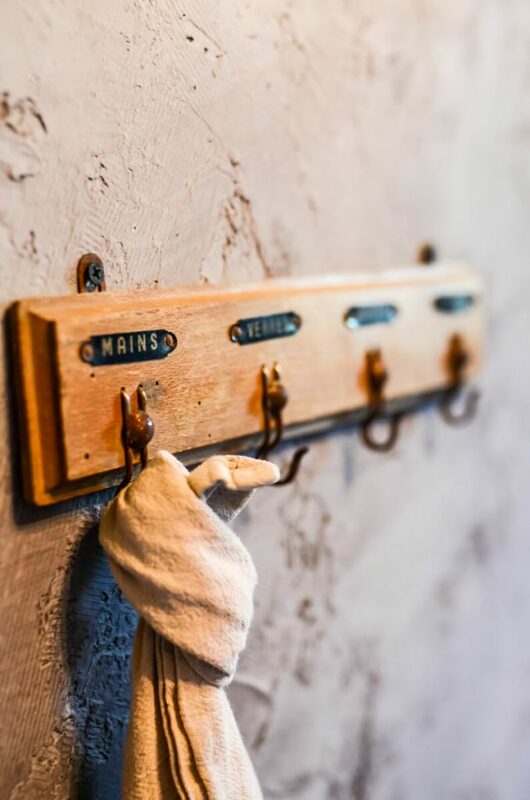 It was sponge painted with Miss Mustard Seed Milk Paint to give it a beautifully aged vibe. 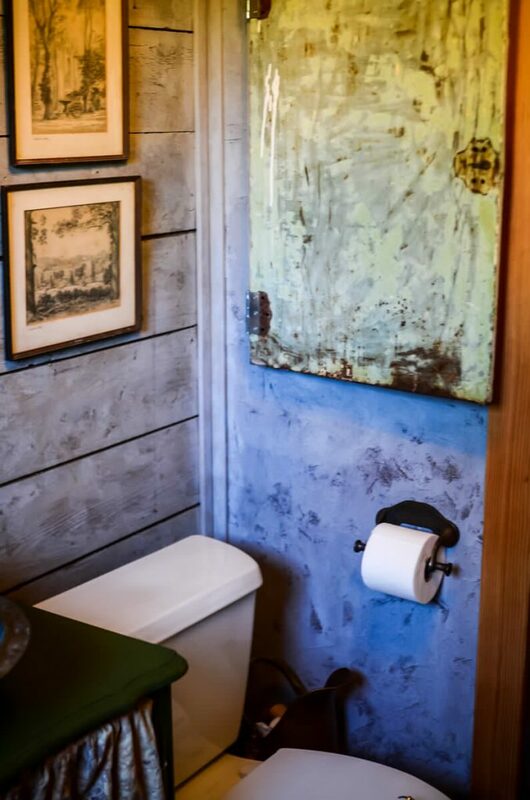 The walls that weren’t lucky enough to have shiplap behind them were retextured with joint-compound and then painted. 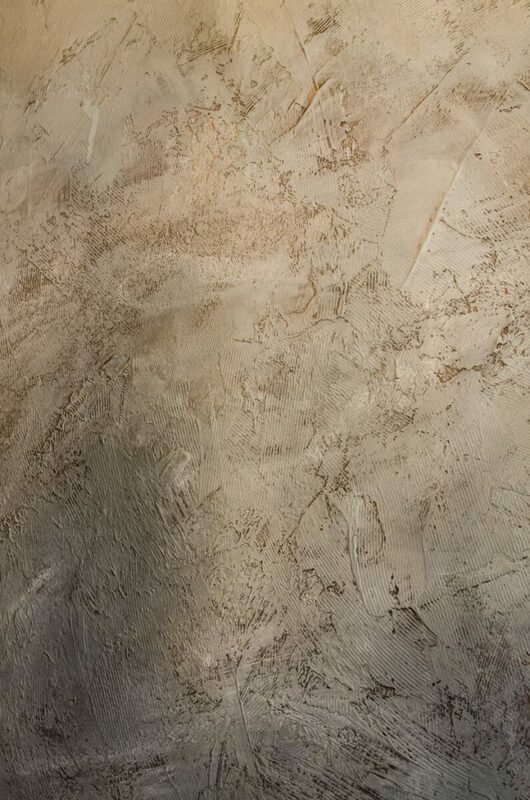 Retexturing allows one to give it the gritty, crumbly wall feel that one loves. If one is like me and loves that type of thing. I’m super big on texture. I have no idea what I’m doing when I do it, I just slap it up and smear it around a bit until I like the way it looks. After the wall was textured and dry, I painted a base coat of brown milk paint and then sponge painted “Shutter Grey” over the top of that. It gave it that delicious dimension so often missing from walls. Basically, now I have to repaint every wall in my house to match because I love it so much. Notice something that wasn’t there before? THE GIGANTIC WINDOW?! That was a fun find. Well, we actually found an old, nasty window and we had to replace it with a nice, pretty one. Which sounds simple. What wasn’t simple is the fact that our entire house is covered in stucco and cutting stucco is certainly easier said than done. Three hardware store trips later, we finally found the tool to do the job. Here’s the current view from the bathroom window – hollyhocks and the henhouse. And lest you think we don’t actually use the bathroom – on the contrary. Six people use it daily. 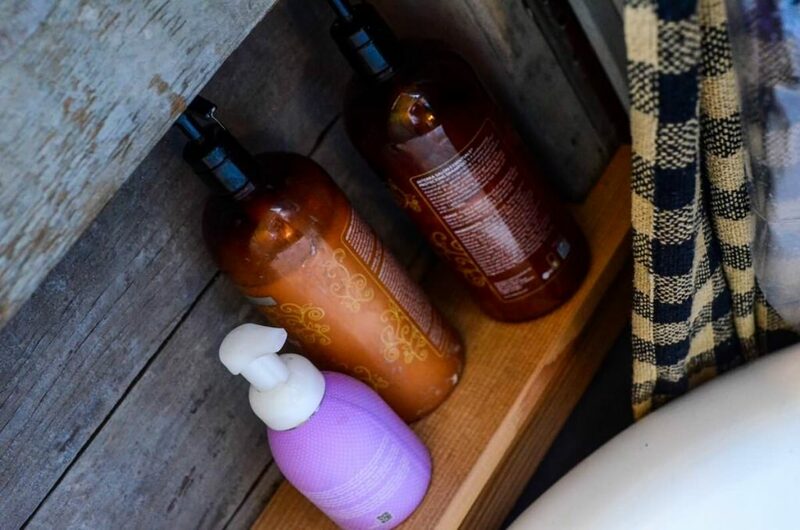 We keep our very basic stash of dōTERRA supplies on a small shelf that Stu built into the shiplap. I was quite particular about picking the right tub for the cottage bathroom and this one did the trick. It’s a refinished tub from the 1940’s. And the “garbage can” was found at a local thrift store. It has lion heads on the handles! I’ve been in love with lion heads ever since traveling in Paris a decade ago. I found this old metal door in our shop when we moved in and practically held Stu at knife-point it get him to incorporate it into the bathroom. We were able to build a small medicine cabinet into the wall here, behind the metal door, to hold toothbrushes, a few essential oils, and hair brushes. You know. The important stuff. 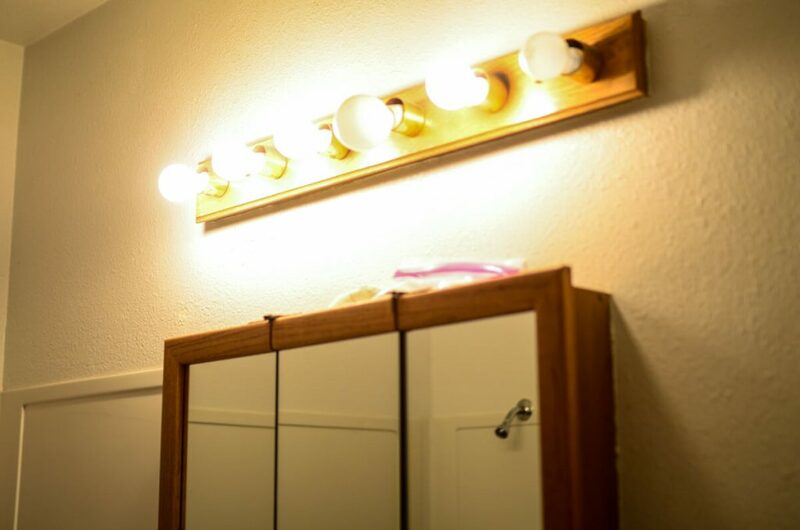 The mirror was another thrift store find and has been hanging around the house waiting for it’s time to shine. 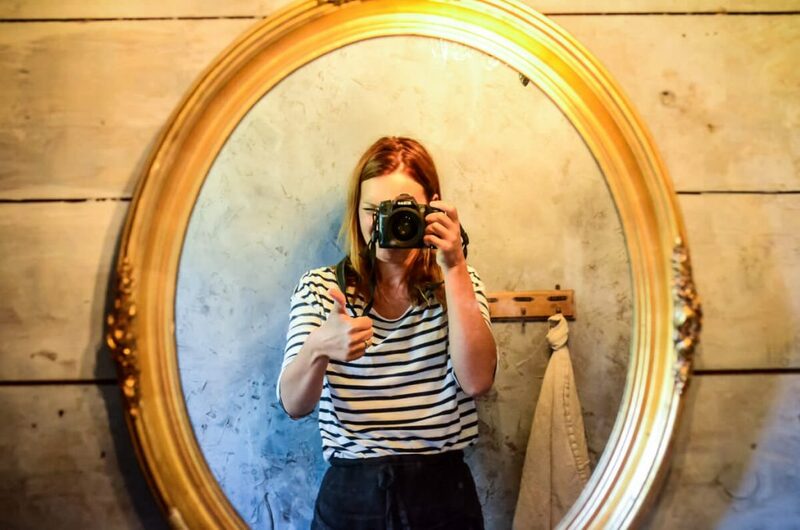 It’s finally here, little mirror. Take it! Oh! Lest we forget the floor. The fir flooring throughout the rest of the house is also in the bathroom (and though it looks slightly blue in this photograph) is really a deep brown that I loved so much, I decided not to refinish it to match the rest of the fir flooring. It stands on its own and is knicked up from decades of use. It’s perfect. We had originally planned on a rock floor, but that plan fell through miserably, and frankly, I still have too much PTSD to talk about it. Maybe someday. You know me and green. I had to sneak it in somewhere. The “Boxwood” shade fits perfectly and keeps it from being too matchy-matchy. « How to harvest raspberry leaves. Lovely job! You are WAY braver than I! We moved into a farm with a hideous bathroom that NEEDED gutting, but with 9 people, (one of us was huge pregnant!) We made the decision to add a second bath first, then gut “old ugly”! It took a lapse of four years, but we finished it last summer! SO worth the effort! It’s so beautiful Shaye! 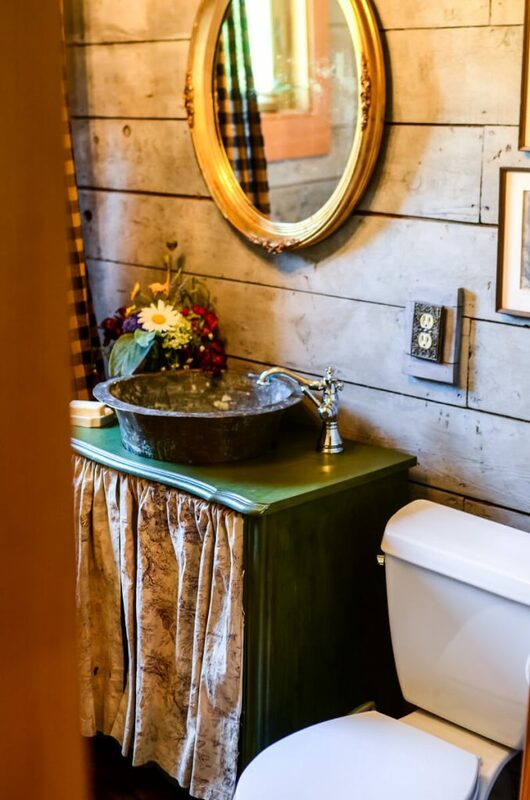 It matches the rest of your house so well and I could hardly believe that the old ugly bathroom was hidden in the middle of your gorgeous house! I’m sure you probably know this, but people used to plant hollyhocks around outhouses so everyone would know where it was without asking ???? Regarding the term “honey bucket”: No, I’ve never heard it. But my father used the term “honey wagon” in referring to the big tanks that pump out the septic tank periodically. Enjoyed reading this and seeing the photos. I’m sorry but not a fan. 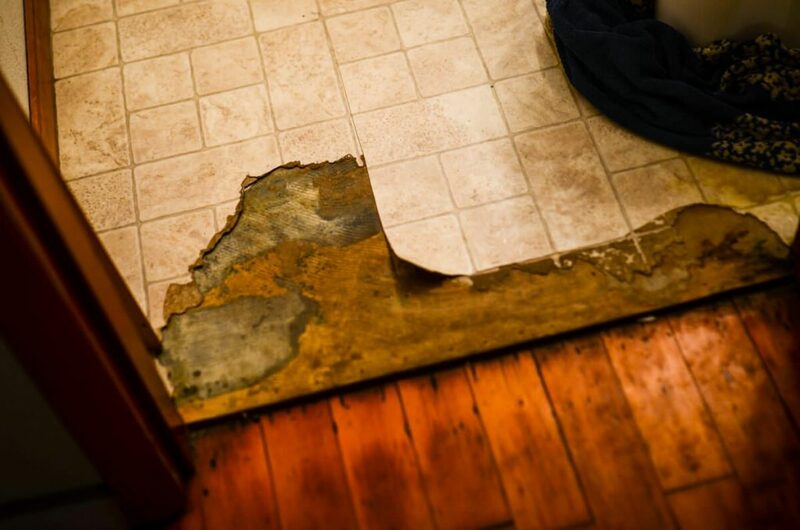 I have had to deal with flaky plaster walls, hardwood floors that never seem to be clean because of the dirt in the cracks, and it just seems so dark. I’m glad you are happy with it though. What works for one person doesn’t work for another. It would drive my cleanliness sensibilities crazy. I like the bathroom to be easy peasy to sanitize. If you like that style it’s really beautiful. Oh. and wood floors with boys….. well it’s hard to remove the odor after a few years of hit and miss. It’s OK to have a difference of opinion. I believe Shay understands that not everyone is going to love everything she does. I have loved her blog and page for years and this is the first time I’ve not liked something. If you are a pro, like Shay is, she knows I’m talking about the bathroom, not her. I love her, her family and her hard work. I love the rustic grand charm it gives! 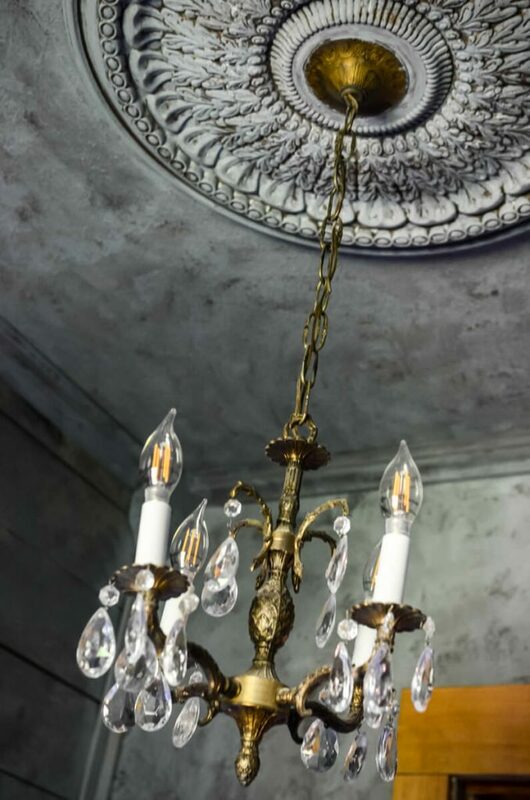 The primitive properties really make the chandelier and elegant things stand out and the elegant touches create a familiar and comforting environment. I’s like no other I’ve seen. As far as Honey Buckets go, we used to call them Blue Lagoons in the Marine Corps while we were out in the middle of nowhere on Camp Pendleton, CA. (If you are nursing, try pumping in one of those. Bleh.) Can’t wait to see more good things from your blog. Love all the thought and planning and hard work that you put into this! Thank you for posting the before and afters…I so enjoy seeing them! The kids are outside and I snuck up to the computer to read the full story after seeing the sneak peak on instagram. Love all you write about in areas of life and farm. I cannot wait for you next book! Well I am a fan! 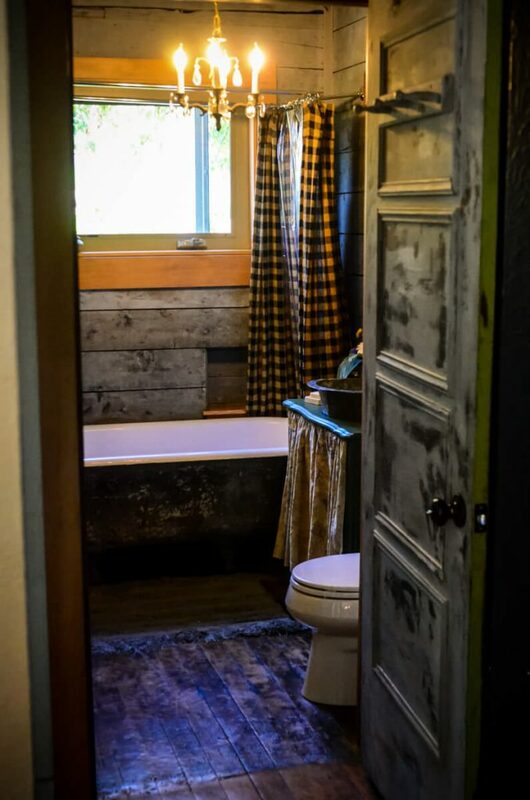 This bathroom has atmosphere…in fact I am jealous and wish I had one like it! Look amazing!! You are so good at making your home your own. I love seeing the progress! This transformation is incredible!! Is it weird that I want to touch everything?! That tub is a thing of beauty! I LOVE IT!!! That is exactly what I want to do with my bathroom! I hate my current bathroom – but thankfully, I don’t have a pink tub – just a white tub that turns orange occasionally from the water! Great job Shaye and Stuart! It is gorgeous! I LOVE IT! You guys did an amazing job. 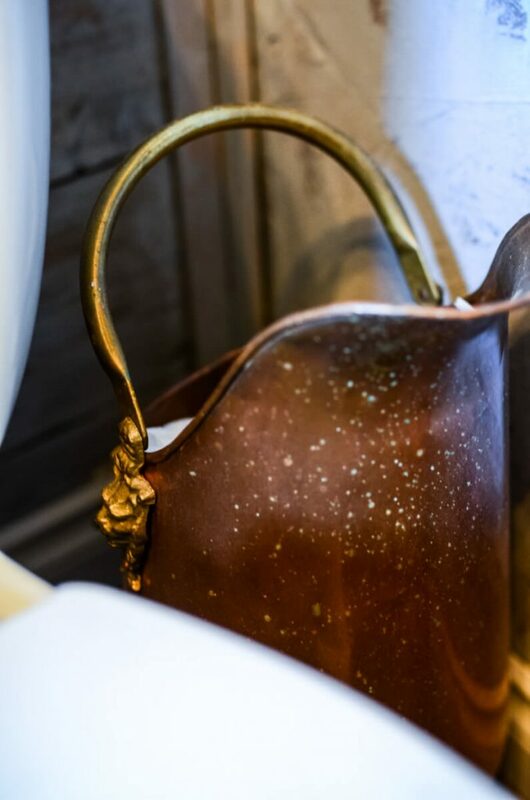 Did you use any type of finishing on top of the green milk paint? THank you. 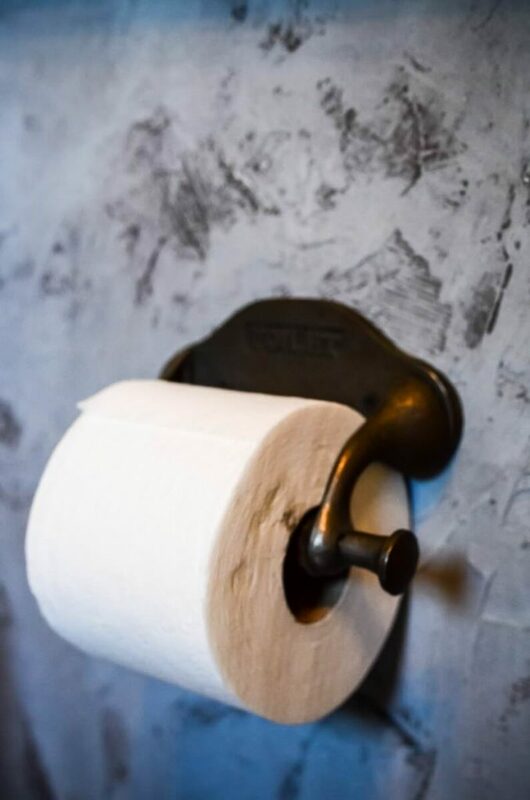 We call them ‘Porta-potty’! But ive definitely heard of ‘Honey Bucket’! Love your before and afters! Getting ready to do some renovating of our own 110 yr old little farm house! I love seeing different ideas and styles! Thanks for sharing! It looks beautiful! I have to ask, though, are you not worried about water damage to the walls and the woodwork from the shower? 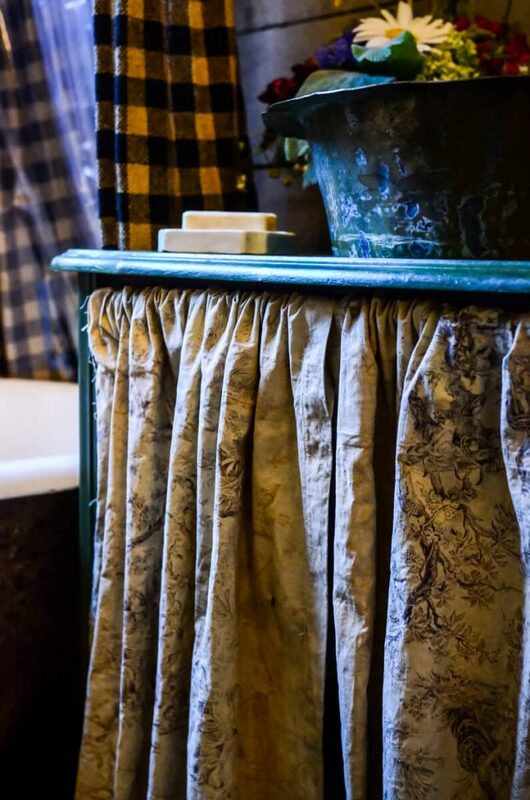 Or does the curtain go completely around the tub and not allow water out? I love your design! The house on our homestead is an old single-wide mobile home which we pray to be able to replace sooner rather than later. 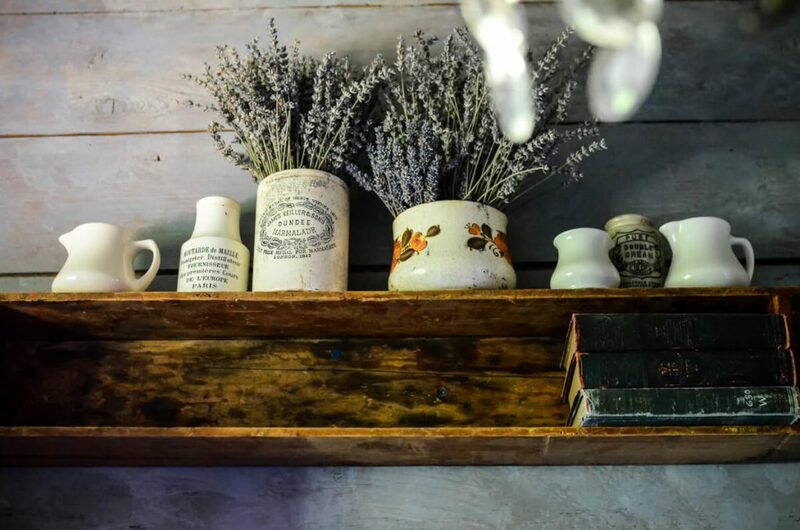 I can’t wait to be able to let my house be an expression of our homestead! One step at a time, I guess. Thank you for sharing! You TOTALLY. R. O. C. K.! Thanks for all your inspiration and creative dreaming! Oh, Shaye, you are such an artistic person!! And so brave to make your dream home YOUR HOME. Enjoy it with your hardworking lovely husband and kids. Wow! That’s an epic transformation. 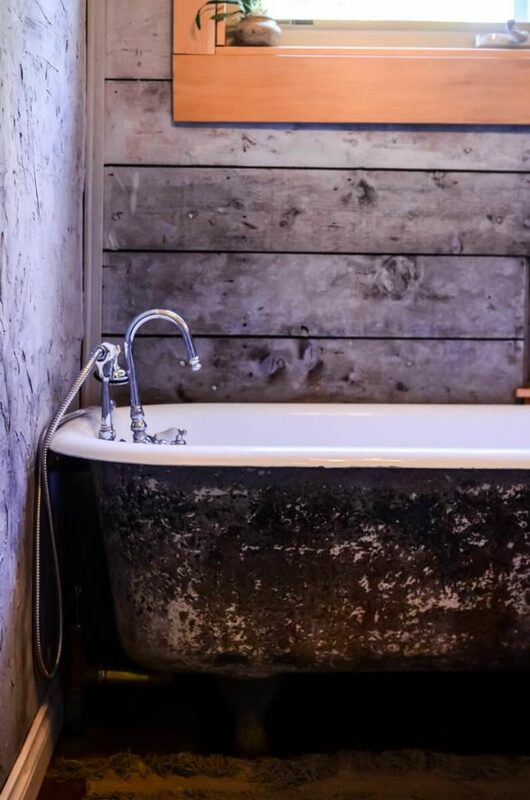 That tub looks absolutely dreamy! Can I ask where you got the shower curtain? Its pretty much perfect and exactly what I’m looking for in our house! We need a little rustic elegance in our base houses.